Oh, weather, weather, weather. We thought we had a three-day window for heading to Norfolk, Virginia, starting on Monday morning of next week, but that seems to be dissolving into a two-day window—not enough to get us to Norfolk. 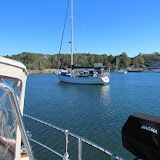 Chris and Geoff of Shambala are leaving on Friday morning for Block Island and that gave us the idea of taking a different route. If we leave on Friday morning and head west through the Long Island Sound, we can spend the weekend getting to Sandy Hook on the south side of New York City. We could leave there on Monday morning and be in Norfolk early Wednesday morning avoiding a full day of beating into south winds. I’m not sure I can get everything ready to go so quickly, but if I can, we might do this. We have never sailed through the New York Harbor so this would be an interesting side trip while, at the same time, helping us get to Norfolk a day earlier than planned. Mark called James, our crew member for the trip, and he says he can get here tomorrow if leaving on Friday is the plan. So we will check the weather again tomorrow morning and make the final decision. Today was another day at Heather’s cooking for the passage south. Then in the late afternoon, I picked Ollie up from daycare and brought him to Windbird for a couple of hours. Sam had soccer practice and Heather needed to spend some time with Jonah working on a school project, so I jumped at the chance of picking Ollie up. We played Legos together and had a great time. He asked if he could spent the night on Windbird with us and I had to hold back the tears when I told him it was a school night and he needed to go home. I’m going to miss that little O, and Sam and Jonah so, so much. I really don’t want to spend the cold winter here on Windbird, but leaving Heather, Jed, and boys makes me so sad. On the way to take Ollie home, I pointed out the empty osprey nests where we watched babies grow up this summer and told Ollie that those babies and the mommas have flown south for the winter and are probably in Florida by now. He made me promise to wave to them when I see them in Florida. I promised I would wave and I also promised that Windbird will return in the spring about the same time as the ospreys. Today was all about those things you do before a passage—weather watching and provisioning. We slept in since it was a late night and when we got up we checked all of our weather sources. Right now it is looking like we will leave here on Monday morning. Stay tuned on that one. We then invited Geoff and Chris to go into town with us to do food shopping. Cruisers always need to go food shopping after a passage, so they were in. After the shopping, they dropped me off at Heather’s so I could cook some of the food I had just bought. They headed up to near the Bourne Bridge to a shop that thought they could help with Geoff’s search for a new connecting hose for Shambala’s cook stove. It took a bit, but they found the needed part. I cooked all afternoon making taco meat sauce, Shepherd’s Pie, and dinner for all of us. Mark, Geoff, and Chris went back to Quissett after getting the propane connecting hose and Mark spent his afternoon getting Windbird’s watermaker removed. Tomorrow he will rebuild it in hopes of getting it working for our trip south. At 6 pm, Mark, Geoff, and Chris drove back into town to have dinner at Heather and Jed’s. Tomorrow is more of the same. Mark will stay on the boat to do the watermaker rebuild. I will go into Heather’s to do more cooking. But before any of this, I will be getting up to listen to Chris Parker’s 7:30 am weather forecast for the East Coast. The weather watch continues. We had double celebrations today. When we got up this morning and Mark went out into the cockpit to look around, he yelled down to me that Shambala was on the mooring right next to us. She definitely was not there when we got home last night, so we figured she arrived early in the morning. About that time, Geoff came out into the cockpit and he and Mark yelled hellos across to each other. 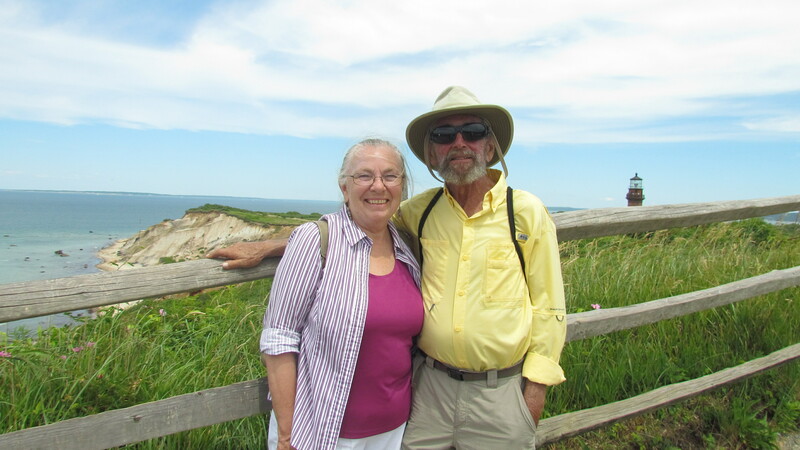 Geoff and Chris on Shambala are our Australian cruising friends that left here in July headed for Nova Scotia and Newfoundland. 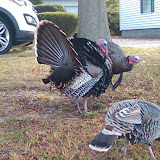 We knew they were trying to get back here to see us before we head south, but the weather was keeping them in Round Pond in Maine. Yesterday the north winds started blowing and they took off, making a very fast trip from there to here and surprising us with their arrival. We could only say brief hellos this morning as we were headed to Boston, but it was great to see them for even a short time. We headed to Boston and made a stop on the way to visit Costco. This was an expensive stop as I was stocking up on many things for the entire winter. So after spending $350, we traveled on to Boston. Mark had had last treatments, one general and one specific liver cancer radiation, and then rang the bell signaling the end of his radiation treatments—definitely a time to celebrate. We then headed home. We ended up having dinner on Shambala, spending time talking about where to from here and hearing a bit about Chris and Geoff’s explorations in Newfoundland. We look forward to hearing more about their travels tomorrow. 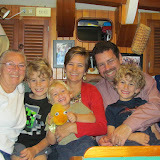 When they leave here they are headed to New York to sail up the Hudson to visit with our mutual friends, Ed and Lynne Kirwin. We would love to incorporate a side trip up the Hudson on our way south, but we’re not sure we have enough time to do it. But we are putting that on the table for consideration. By Wednesday of this week, we hope we have a good enough handle on the weather to make a final decision. As of tonight, however, it looks like we will leave here on Monday and head straight for Norfolk. As always, the weather will determine our course. 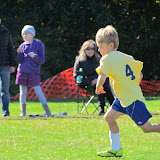 It was another Soccer Saturday for Oma and Granddad. We went to Sam’s game in the morning, brought Ollie back to the boat for lunch, and then drove back into Falmouth for Jonah’s 1:30 pm game. After the game we drove to Heather and Jed’s so we could use their yard to roll out Windbird’s original mainsail to check it out. 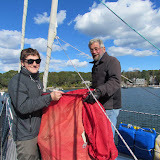 Our current mainsail is showing signs of old age and we wanted to see if the old sail is in good enough shape to use as a backup. The captain thinks it is, so we’ll take it with us . . . just in case. It is looking like we might have a weather window ‘of sorts’ that will allow us to leave here a week from today. The winds turn to come from the north on Friday, but at this point Friday looks a little too windy with unsettled seas. Things settle down on Saturday and then settle a little too much on Sunday. As it looks right now, we might be motoring most of the way. 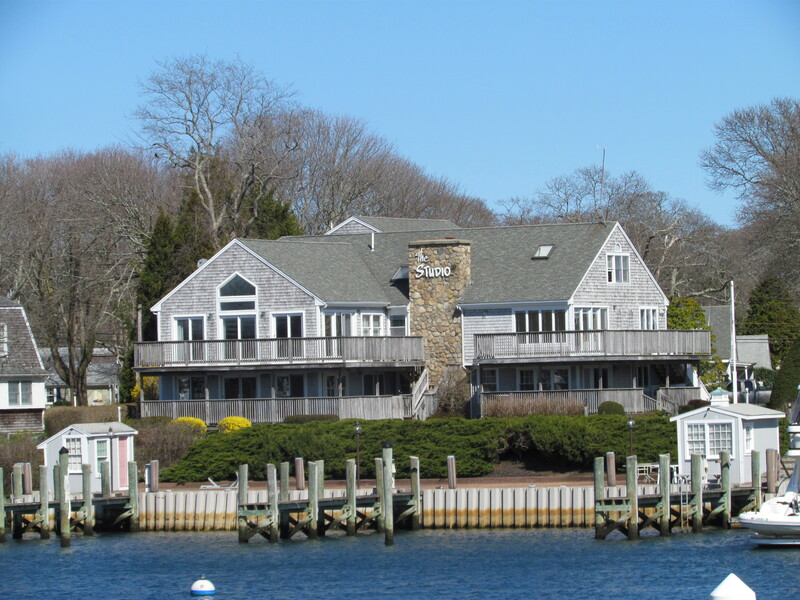 We’d like to wait for an opening that would allow us to sail, but the forecast for the following week looks bleak. We might just have to take the less than perfect window and motor. 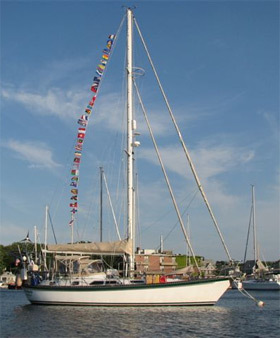 Tomorrow the young man who is going to go with us as crew is coming down from Boston to meet Windbird. James is the grandson of Jed’s Aunt Sue and Uncle John and I think the last time we saw him was Christmas of 2007 in Maine when he was ten. Tomorrow we will go over Windbird’s major systems with James and answer any questions he might have. Then we will get serious about getting ready to sail south. Much to do this week!